Music Junkie Press: Thank you so much for taking the time to talk with us here at Music Junkie Press. With the new name, will we be seeing a new album and if so, when might that be? Ty Johnson: Yes, we currently have a few songs ready and as for a release date for the new album it’ll most likely be early Fall. Music Junkie Press: We are very excited about the new album and can’t wait for it! Can you remember what was the first concert you ever went to? Ty Johnson: My first concert was Silverstein, The Devil Wears Prada, A Day to Remember and Protest the Hero. I was 15 and I fell in love with the energy in that place. Still to this day one of the best shows I’ve ever seen! Music Junkie Press: That sounds like a great concert, I can only imagine the energy of that show. How old were you when you started playing and can you remember what was the first song you sang or played in its entirety? Ty Johnson: Wade and I started the band when we were freshmen in high school. The first song we ever got together and wrote was “Does one bullet?” haha. You won’t be able to find that one online, thank god. Music Junkie Press: We may have to do some searching for one that one!! 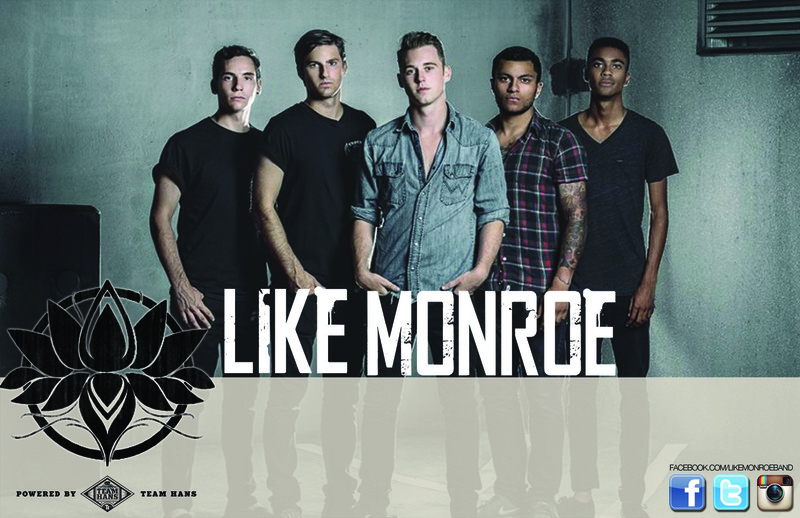 If Like Monroe could put together their dream lineup, what other three bands (living or dead) would you like to see on your lineup? Ty Johnson: All of us would have to agree on Underoath. The Devil Wears Prada would be an awesome band to tour with. Lastly, I’m going to go with Katy Perry. If you’re reading this Katy. Call me. Music Junkie Press: We will have to let Katy know where to reach you! Will Like Monroe still be heading out on the Texas Take Down Tour and if so, will you playing all your A Candle Lit City songs and anything new? Ty Johnson: Yeah and we are very excited to hit the road with our buddies Against the Archaic! We will be play two songs off the “A Light in the Dark” E.P and then two new ones as well. Music Junkie Press: That is going to be a great tour. If only we were in Texas! We will have to get one of our reps out there to check it out. If you could take any song from any other genre and turn it into your own style, which might it be? Ty Johnson: Well I always thought it’d be cool to cover Drake’s song “Started from the bottom”. Its really catchy and always gets stuck in my head. Music Junkie Press: That is a good one and I can see how you can change it up and give it your own style. If I could peak into your Ipod/playlist what would the next three songs be on shuffle? Music Junkie Press: I love the variety you have. Lastly, do you have anything else you would like to share with our audience? Ty Johnson: We are excited to push on and start a new identity with a new name and image. In the next few days we will be posting an introduction video and go a little more in depth with what has been happening. We are excited to start this new chapter for us, now that we’re continuing on a new path we cant wait to take whoever is coming along with us. You all have played such an important role in this, and each and everyone of you are as important as we are, you are what keeps us going. We hope we get to meet everyone of you on tour, and also thank you so much to everyone who has ever supported us, bought or downloaded a CD, merch, or came to a show. You have no idea how much everything meant to us. Nothing makes us feel anywhere close to the feeling that music gives us. We have been insanely blessed to be able to do what we have done with A Candle Lit City and we think it’s time that we wrap up this chapter in our lives. We are sad to lay A Candle Lit City to rest, but are very excited for what is next in this new chapter and what is in store for LIKE MONROE! You are doing just that and I think it is exciting! I trust that all A Candle Lit City fans and your new ones are here to support you and the band during this change. We will share the introduction video when it is out and let everyone know where to find Like Monroe. So make sure to check them out and follow them at all their new social media sites. We will keep you updated when we get the video introduction and updates as to the new record. If you are in Texas don’t miss them on their Texas Takedown Tour where they will be playing with Against the Archaic.